Discussion in 'Luthiery, Modifications & Customizations' started by Dayviewer, May 19, 2018. So I've really been missing a guitar for lower tunings (I just have a 6 in standard) and I'd love to have a baritone. However I really love my Fender style guitars and there isn't much that choice out there. The older models are hard to get your hands on and I'm not really excited to take the current Squire for some upgrades, so I'm looking into doing a Warmoth build. The style of music I'm looking to play with this can mostly be compared to Breaking Benjamin/Sevendust/Devin Townsend/Periphery, most of the low tuned stuff that get's both heavy and melodic, lot's of use of cleans too. But you guys are of course also very knowledgeable and I'd love to get thoughts/opinions on this thing. Would love suggestions for pickups too, from what I'd know the Juggernauts would work well with alder and maple, but I have no idea how they'd go in a chambered body. Also they might be a bit 'too djent' for my playing style, although I do read everywhere that they're quite versatile. But yea, please let me know what your thoughts are on this thing, and if you have any suggestions, would love to hear that! ThePhilosopher and Randy like this. Looks like a cool build! 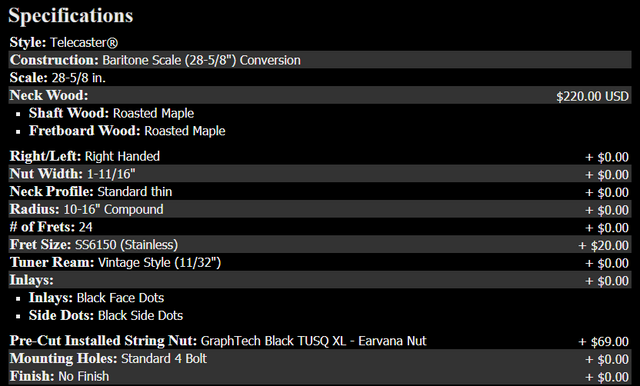 Now, I'm not totally boned-up on Warmoth's feature sets, but with the neck style "telecaster" that's just pertaining to the headstock shape and not a squared-off heel in addition, right? looks like a cool build, i've put together a couple warmoth builds myself. Only thing I'd change is the pickups. The juggernauts have a very distinct kind of cocked wah quality that you either love or hate (personally I hate that sound since you can't eq it out). If you want versatility in terms of voicing/eq I'd go with an impulse set. They're pretty balanced sounding and do well in pretty much any genre. (For reference) I’d say this is more an offset Tele build, which is awesome. Personally, I’d go with Black Dogs for a build like this. Tight, ballsy sounds with high gain, but can split or roll back for some killer PAF sounds befitting of the guitar it’s going into. It's both the headstock shape and how it'll fit in the pocket, that's why I also selected the Telecaster neck pocket for the body configuration. Yea that's why I have some doubts on wether I should do it or not. I'm really not sure on the impulse set though, the cleans sound too thin for my liking and it sounds like it's too focused on the single note djent stuff, which I do like but it's not my own personal style. Yep! Eventually they're both the same thing, some people call them offset Tele's (Fender too I believe), Warmoth calls it a Jazzcaster. Black Dogs sound good too I'll check those out, also been looking at the Alnico Nailbomb, and I LOVE the cleans of the Emerald. How does having a chambered body change affect of all this though? I love the idea of having more resonance and a ''larger'' sound, but could I still get a tighter hard rock/metal sound out of it without getting too muddy etc? 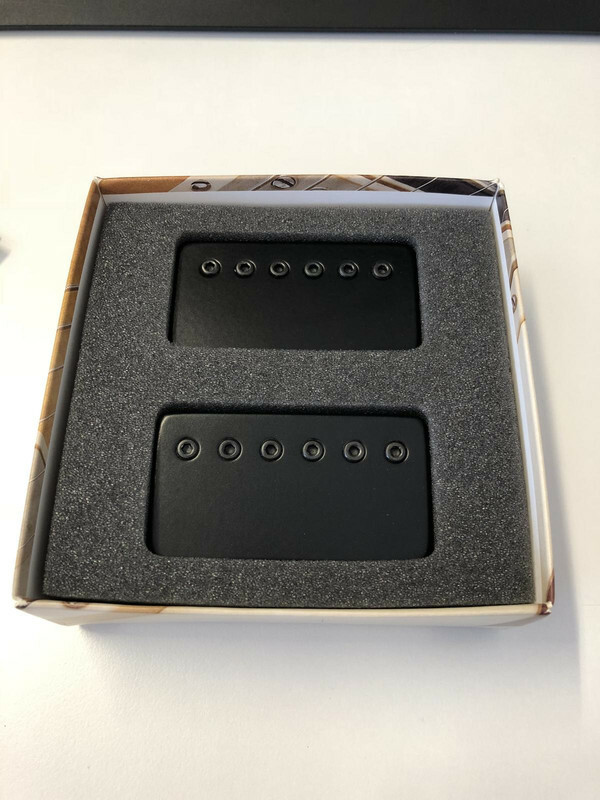 I have demos of the a-bomb, black dog and impulse pickups over in my pickup shootout thread. Take a listen and see which ones you prefer. I wouldn't worry too much about a muddy sound with any of those pickup choices. I tested them in an all mahogany baritone in drop b through a boogie f30 and they all held up well in terms of clarity. Out of those three the impulse and nailbomb would be the most bass heavy, though they're not flubby by any means. 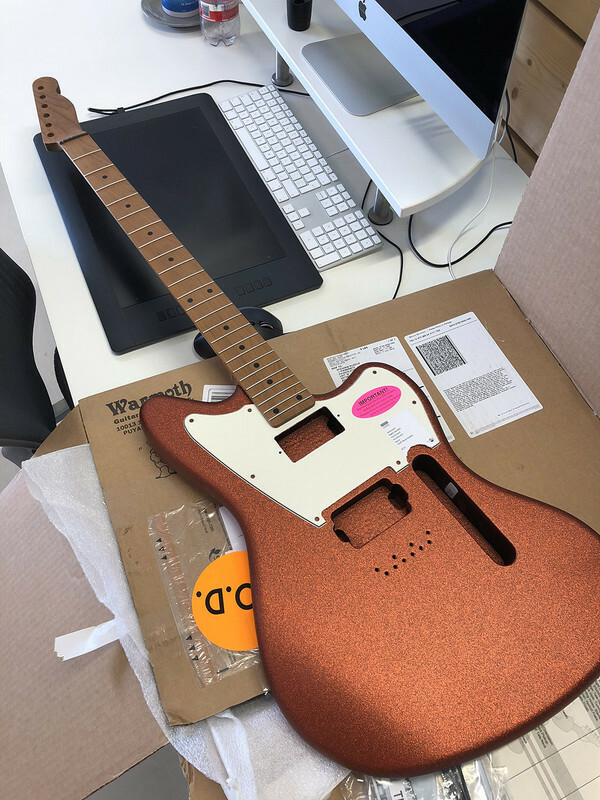 If I remember correctly, I've seen that shape referred to as "Jazzcaster", as it is here in this thread. It is a very elegant, classy and classic shape in my opinion. It is a very elegant, classy and classic shape in my opinion. Agreed! I love modern heavy tones and playing but I just prefer the Fender style guitars in terms of playability and visuals. So that's why I have to resort to either modding or something custom because there ain't much out there for sale with the combination haha. Bobro and KnightBrolaire like this. Chamber the body if you want a lightweight guitar. Otherwise save your money. Chambering is a hotly debated topic, but if you're playing high gain stuff it isn't going to affect your sound in a noticeable way. Interesting! well I play a lot of cleaner stuff too but high gain definitely has a preference overall. But thanks I'll consider leaving it out I'll read up a bit on it more. My Warmoth Bari-Tele is one of my favorite instruments to play, and I know a couple of folks that have a Bari-Jazz. I really think that Baritones shine the most in single coil voicings as the clarity in the lower range is retained. 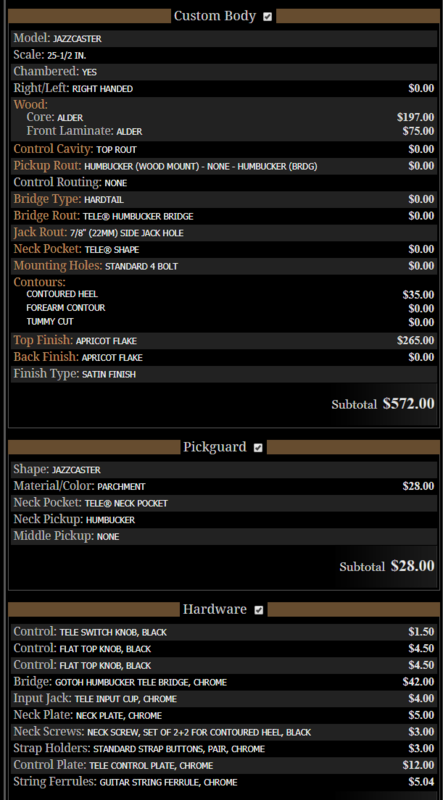 Just placed the order at Warmoth! went with a solid body instead, otherwise everything is the same specs. For the pickups I think I'll be settling with the Blackdog for the bridge and Emerald for the neck, I'll be ordering those later. Plenty of time before the package from Warmoth arrives anyway haha. When everything is here I'll be taking it to a custom shop who will assemble it for me, I'm too scared to mess something up myself. ThePhilosopher, A-Branger, LiveOVErdrive and 8 others like this. woah this loooooks 100X better than the mockup. That colour finish is outrageously good. I would have gone 24fret myself personally just because im funny like that, but in general this is going to be sweet. Thanks guys! 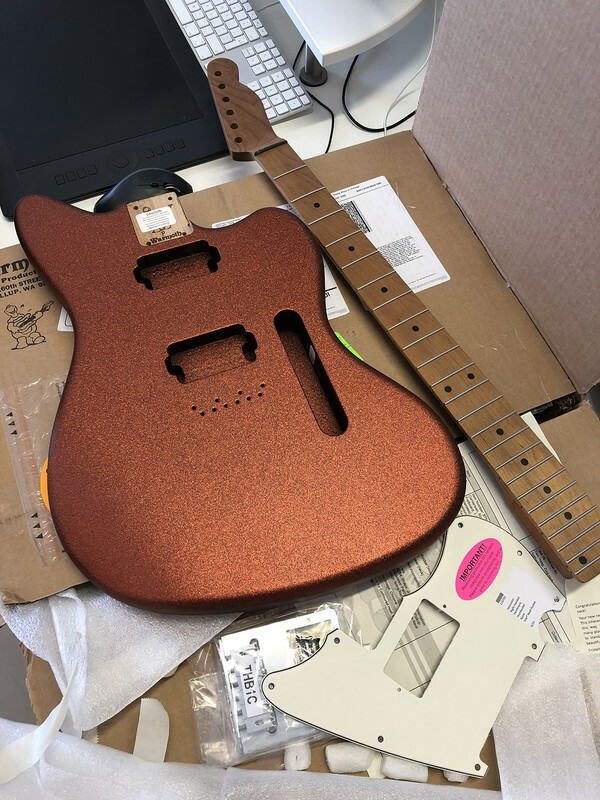 I'm ordering the pickups soon too and then it's just waiting for when I have enough money for the rest of the parts and getting the assembly done. I wasn't counting on this coming in so quickly so I can't finish it right now due to financials, so yea It's gonna be September I think! Yeah man it's kinda unreal for me to see it like this already as I came up with the first idea 2 years back can't wait. In the mockup it was 22 but as you can see the actual neck is 24 feels great too! can't wait to play it. Pickups arrived a few days ago! I'll be bringing everything to the shop by the end of August for assembly, though they'll probably have to order some of the final parts as well, could take 2 or 3 weeks from then.